Nucleus (17 linear scaffolds ~ 120 megabases (Mb), GC content of coding sequence = 64%, 14488 genes) - Merchant, S. S., S. E. Prochnik, O. Vallon, E. H. Harris, S. J. Karpowicz, G. B. Witman, A. Terry, A. Salamov, L. K. Fritz-Laylin, L. Marechal- Drouard, W. F. Marshall, L. H. Qu, D. R. Nelson, A. A. Sanderfoot, M. H. Spalding, V. V. Kapitonov, Q. Ren, P. Ferris, E. Lindquist, H. Shapiro, S. M. Lucas, J. Grimwood, J. Schmutz, P. Cardol, H. Cerutti, G. Chanf- reau, C. L. Chen, V. Cognat, M. T. Croft, R. Dent., S. Dutcher, E. Fernan- dez, H. Fukuzawa, D. Gonzalez-Ballester, D. Gonzalez-Halphen, A. Hall- mann, M. Hanikenne, M. Hippler, W. Inwood, K. Jabbari, M. Kalanon, R. Kuras, P. A. Lefebvre, S. D. Lemaire, A. V. Lobanov, M. Lohr, A. Manuell, I. Meier, L. Mets, M. Mittag, T. Mittelmeier, J. V. Moroney, J. Moseley, C. Napoli, A. M. Nedelcu, K. Niyogi, S. V. Novoselov, I. T. Paulsen, G. Pazour, S. Purton, J. P. Ral, D. M. Riano-Pachon, W. Riekhof, L. Rymarquis, M. Schroda, D. Stern, J. Umen, R. Willows, N. Wilson, S. L. Zimmer, J. Allmer, J. Balk, K. Bisova, C. J. Chen, M. Elias, K. Gendler, C. Hauser, M. R. Lamb, H. Ledford, J. C. Long, J. Minagawa, M. D. Page, J. Pan, W. Pootakham, S. Roje, A. Rose, E. Stahlberg, A. M. Terauchi, P. Yang, S. Ball, C. Bowler, C. L. Dieckmann, V. N. Gladyshev, P. Green, R. Jorgensen, S. Mayfield, B. Mueller-Roeber, S. Rajamani, R. T. Sayre, P. Brokstein, I. Dubchak, D. Goodstein, L. Hornick, Y. W. Huang, J. Jhaveri, Y. Luo, D. Martinez, W. C. Ngau, B. Otillar, A. Poliakov, A. Porter, L. Szajkowski, G. Werner, K. Zhou, I. V. Grigoriev, D. S. Rokhsar, and A. R. Grossman. 2007. 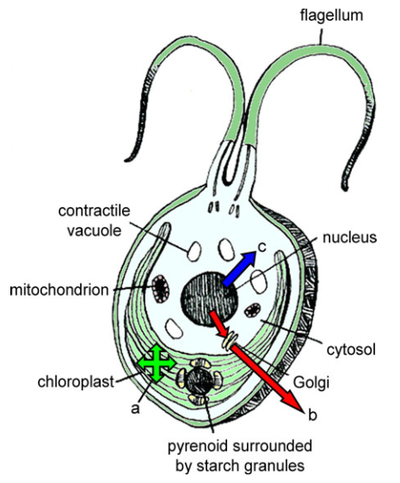 The Chlamydomonas genome reveals the evolution of key animal and plant functions. Science 318:245–250. Phaeodactylum tricornutum - has the unusual property of being pleiomorphic (can occur in different shape and form), and this plasticity is related to the atypical nature of the cell wall, which is only poorly silicified compared with other diatoms (Lewin et al. 1958, Borowitzka and Volcani 1978). P. tricornutum exists in three different morphological forms: oval, fusiform, and triradiate. Basic biological features of P. tricornutum are relatively poorly studied, in particular its life cycle and its ecological relevance. The species appears to be unique in that it does not have an obligate requirement for silicic acid. The 27.4 Mb P. tricornutum nuclear genome currently exists as 33 individual scaffolds. These scaffolds are described as chromosomes in reports on the genome sequence, although ongoing work to completely close the genome sequence may collapse some of these scaffolds without telomere-to-telomere coverage into single chromosomes. ﻿Micromonas pusilla﻿ (Worden, A. Z., J. H. Lee, T. Mock, P. Rouze, M. P. Simmons, A. L. Aerts, A. E. Allen, M. L. Cuvelier, E. Derelle, M. V. Everett, E. Foulon, J. Grim- wood, H. Gundlach, B. Henrissat, C. Napoli, S. M. McDonald, M. S. Parker, S. Rombauts, A. Salamov, P. Von Dassow, J. H. Badger, P. M. Coutinho, E. Demir, I. Dubchak, C. Gentemann, W. Eikrem, J. E. Gready, U. John, W. Lanier, E. A. Lindquist, S. Lucas, K. F. Mayer, H. Moreau, F. Not, R. Otillar, O. Panaud, J. Pangilinan, I. Paulsen, B. Piegu, A. Poliakov, S. Robbens, J. Schmutz, E. Toulza, T. Wyss, A. Zelensky, K. Zhou, E. V. Armbrust, D. Bhattacharya, U. W. Goodenough, Y. Van de Peer, and I. V. Grigoriev. 2009. 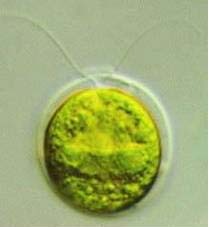 Green evolution and dynamic adaptations revealed by genomes of the marine picoeukaryotes Micromonas. Science 324:268–272.). Source: Liolios, K., K. Mavromatis, N. Tavernarakis, and N. C. Kyrpides. 2008. 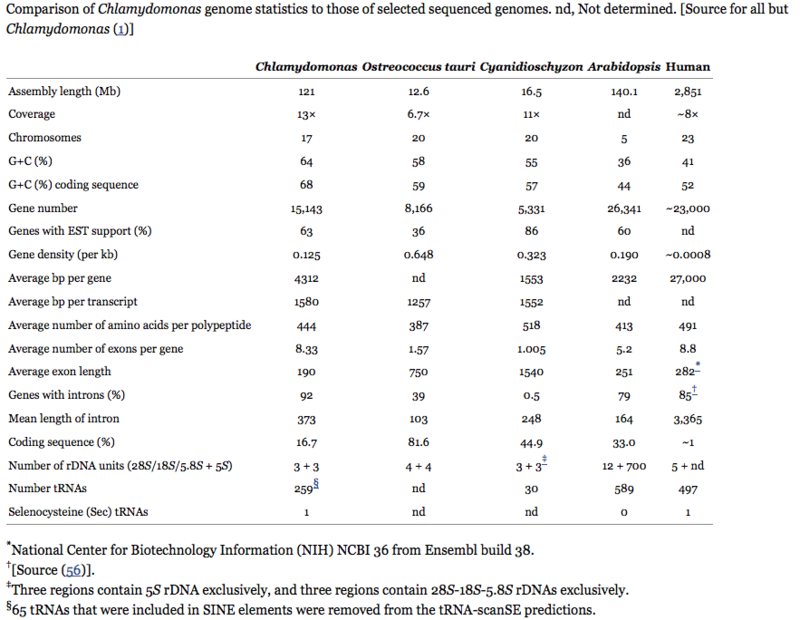 The Genomes On Line Database (GOLD) in 2007: status of genomic and metagenomic projects and their associated metadata. Nucleic Acids Res. 36:D475–D479. Interesting observations have been made after genome sequencing microalgae: Diatoms such as Phaeodactylum tricornutum (affectionately referred to as "P.T." by researchers) are as far as 55% divergent from the centric diatom Thalassiosira pseudonana (affectionately referred to as "T.P." by researchers) genetically - that is almost as divergent as Phaeodactylum tricornutum is to a common water mold (Phytophthora sojae) - Table 2. ﻿In addition, there are several completed and ongoing efforts to sequence plastid and mitochondrial genomes, as well as dynamic transcriptomes from many different microalgae (see 4, 9, 29, 66, 73, 101, 105, 130, 133, 149, 161, 169, 171, 196, 198 - references from Radakovits 2010 - Eukaryotic cell).